Black Adam is a fictional character appearing in American comic books published by DC Comics. Created by Otto Binder and C. C. Beck, the character is a recurring enemy of the superhero Shazam. Black Adam first appeared as a one-time villain for the first issue of Fawcett Comics' The Marvel Family comic book (December 1945). However, Black Adam was revived as a recurring character after DC Comics first licensed and then acquired the Fawcett characters and began publishing Captain Marvel/Marvel Family stories under the title Shazam! in the 1970s. As originally depicted, Black Adam was a corrupted, ancient Egyptian predecessor of Captain Marvel, who fought his way to modern times to challenge the hero and his Marvel Family associates. 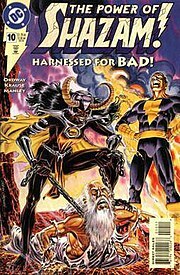 Since the turn of the 21st century, however, Black Adam has been re-defined by DC Comics writers Jerry Ordway, Geoff Johns, and David S. Goyer as a corrupted antihero attempting to clear his name and reputation. Featured roles in such comic book series as Justice Society of America (JSA), Villains United, Infinite Crisis, and 52 have elevated the character to an unprecedented level of prominence in the overall universe of DC Comics characters. The canon version of Black Adam appeared only once during Fawcett's initial publication run of Captain Marvel comics. 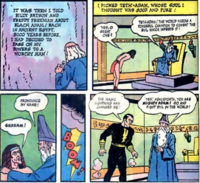 In The Marvel Family #1, Black Adam is an ancient Egyptian named Teth-Adam (i.e., "Mighty Human"), who is chosen by the wizard Shazam to be his successor due to his presumed moral purity. This story is reprinted in DC's Shazam! #8 (1973), which is his true first appearance in the Bronze Age. Black Adam's origin, as seen in The Marvel Family #1 (1945). Art by C. C. Beck and Pete Costanza. When Teth-Adam says the magic word "Shazam," he is transformed into a super-powered being possessing the same powers that Captain Marvel would later be granted; however, Mighty Adam is soon corrupted by the vastness of his powers. Originally, the wizard Shazam grants Adam powers derived from ancient Greco-Roman deities; later in the series, it was changed to ancient Egyptian deities. Deciding that he should rule the world, Mighty Adam overthrows and kills the pharaoh and assumes the Egyptian throne. Angered by this betrayal, Shazam renames his errant champion "Black Adam," and—unable to revoke the powers he gave Adam, banishes him to the most distant star in the universe. Black Adam wore a costume almost identical to Captain Marvel's -- except black, instead of scarlet, and cape-less. Later, Dr. Sivana uses his resurrection machine to resurrect Adam. When last seen during the Crisis On Infinite Earths, (pre-Crisis version), Adam was fighting the heroes on the 5 remaining and partially merged Earths. While he is defeated in the same story in which he debuted, the non-canon or DC version of Adam is resurrected nearly thirty years later in Philadelphia by Doctor Sivana's reincarnation machine in DC Comics' Shazam! revival of the Marvel Family characters. He then destroys the machine so he cannot be sent back. According to Shazam! #28 (Black Adam's first New Appearance, but second actual appearance, in the Bronze Age), Black Adam gets his powers from Shu (stamina), Hershef (strength), Amon (power), Zehuti (Thoth) (wisdom), Anpu (speed), and Menthu (courage). Black Adam accidentally time-travels to 1776 while going to the Rock of Eternity to destroy Shazam at Sivana's suggestion, as Sivana actually felt Adam's powers would be wiped out as well, but Cap accidentally threw him back in time. He and Cap battle and Adam realizes he will have to use a trick. He makes his lightning strike Cap, turning him back to Billy, then seizes him and covers his mouth before he can finish saying his magic word. He then flies to a nearby ship and gets some rope to bind and gag Billy, after which he throws him into the sea. But Billy swims up, is saved by one of the colonist rebels, and freed. He realizes the man is Paul Revere, ironic since earlier in the story he repaired Revere's statue, and returns to his own time when Shazam tells him Black Adam is there. Adam is once again tricked by Uncle Marvel into saying "Shazam" when he goes to him to get revenge, and gets amnesia from a punch by Captain Marvel. After that, Black Adam is also involved with Karmang in All-New Collectors' Edition #C-58 (Black Adam's third appearance, but second New appearance in the Bronze Age) and tries to destroy both Superman and Captain Marvel. After several more defeats at Captain Marvel's hands, Adam joins Mister Mind's final pre-Crisis version of the Monster Society of Evil which stages an assault on the Rock of Eternity. The evil god of magic Oggar summons an evil army from the sands and dust of Egypt for Adam to lead after muting Billy with his magic. Despite being defeated, they escape. Adam's origin is revised for the 1987 miniseries Shazam! : The New Beginning. In this timeline, Adam was not banished to the depths of the universe, but to another dimension. The need for Captain Marvel to oppose him is made an integral reason for why Billy Batson is recruited by Shazam. Soon after that call, the corrupted champion is drawn from the netherworld by an inter-dimensional transport device created by Dr. Sivana. After being drawn from the netherworld he speaks only in Egyptian (he also has lightly tan skin) and he uses the Wisdom of Zehuti to learn English. The character is revealed to be far more cruel and ruthless than his previous incarnation. Soon after he appears, he destroys Sivana's machine and is about to kill him. Adam then figures he needs a guide in this new world, and makes Sivana his slave instead. He admires the new world, which he describes as such: "Interesting city, whose towers dwarf even the temples of Memphis... wagons, which move without beasts to pull them (cars)... even a vast bridge of metal, spanning water as wide as even the Nile itself at flood!" When battling Captain Marvel, Adam, with his super-strength, holds an airplane full of passengers, and blackmails the hero into departing. After that, he kidnaps the airplane full of passengers, hiding all of them in the sea. Fortunately, Captain Marvel is successful in banishing Black Adam to the netherworld again, and saves the people. (Left to right) Blaze, Shazam, and Black Adam, on the cover of The Power of Shazam! #10 (1995). Art by Jerry Ordway. Black Adam is reintroduced to the DC Universe in The Power of Shazam! graphic novel by Jerry Ordway in 1994. In that story and the subsequent Power of Shazam! ongoing series, Adam is a deadly and evil adversary for Captain Marvel. In this revised origin, Teth-Adam was born on September 11, 1279 BC. Teth-Adam is the son of the ancient Egyptian Pharaoh Ramesses II, and impresses one of the high priests, the wizard Shazam, with his good deeds. The wizard gives Teth-Adam the power to become the superhero Mighty-Adam by speaking the name "Shazam," an acronym for Mighty Adam's powers: the stamina of Shu, the swiftness of Heru (Horus), the strength of Amon, the wisdom of Zehuti (Thoth), the power of Aton, and the courage of Mehen. He does not draw powers from Shazam due to the demoness Blaze making a deal with the Egyptian god Set. Mighty Adam serves as Egypt's champion for many centuries, but becomes corrupted by the charms of a mysterious woman, revealed to be Shazam's evil daughter Blaze in disguise. The bewitched Adam is convinced that he and his mistress should rule Egypt, so he kills the Pharaoh and appoints himself ruler. Shazam learns of this treachery and strips Adam of his powers, encasing them in a mystical scarab necklace. Adam's depowered body rapidly experiences the aging process that the magic had staved off, and the former hero withers away into a dried cadaver in seconds. Shazam buries both the body and the scarab in the tomb of Ramesses II, where he plans for it to remain for all eternity. In death, the former hero is referred to as "Khem-Adam" ("Black Adam"). Disillusioned by what he perceived as Adam's betrayal, Shazam waits several millennia before appointing a second champion to fight evil in his name. Thousands of years later, during the late 20th century, an unscrupulous archaeological aide named Theo Adam finds himself assigned to the Malcolm Expedition, financed by the Sivana Foundation to excavate the tomb of Ramesses II. Adam uncovers Khem-Adam's tomb in a secret passageway, and leads his superiors, C.C. Batson and his wife Marilyn, to the discovery. Upon first sight of Khem-Adam's scarab, Theo Adam becomes obsessed with the artifact, and kills both Batsons in order to steal it. Escaping Egypt, Theo Adam soon made his way back to America. The Batsons' son, Billy, has been left behind in the United States, and is drafted by Shazam to become the wizard's second champion, Captain Marvel. When Theo Adam first encounters Captain Marvel, he notes both Marvel's identical appearance to C.C. Batson and the lightning-bolt insignia on Marvel's chest that had also decorated Khem-Adam's tomb. Adam therefore has a revelation, and realizes that he is a reincarnation of Khem-Adam. Grasping his stolen scarab, Adam speaks Shazam's name and is transformed into the super-powered Black Adam. Black Adam reveals himself to Captain Marvel as the Batsons' killer, and the two battle. Captain Marvel emerges victorious by snatching Adam's scarab, and therefore his power, away from him. However he saves him from being crushed by a falling building. Marvel brings Theo Adam to Shazam, who wipes Adam's memory and takes away his voice, so that he cannot access his powers. This solution proves temporary, as Blaze reenters her former lover's life and helps restore his voice, his memory, and access to his powers. Although Adam appears during the Power of Shazam! ongoing series' first year of publication as a villain, towards the end of the series' run, Adam returns and announces that Black Adam and Theo Adam are separate personalities. Black Adam stands trial again for the murders of the Batsons, and is acquitted when it is revealed that his fingerprints do not match those of Theo Adam. The reformed Black Adam is still vulnerable to his murderous host's influence, and he attacks the Justice Society of America under Theo Adam's control in JSA #6 (1999). In subsequent issues, Adam joins supervillain Johnny Sorrow's Injustice Society after Sorrow removes a malignant tumor from Adam's brain. He is sent to battle Wildcat, and easily defeats him, showing how easily he could kill him by taking him about 25,000 feet above the ground—just high enough for them to talk while unable to go any higher without the human Wildcat freezing or suffocating—explaining the different ways he could kill him, and asking what he will give for his life. He shows him the Rock of Eternity where Sorrow has turned Shazam to stone with his cursed face that usually kills those that see him, also making contact with the Spectre, who provides them with additional information. Adam soon betrays Sorrow, and he and the JSA defeat the Injustice Society. Black Adam briefly gives Flash the speed of Heru enabling him to defeat Johnny Sorrow by hitting him at near-lightspeed when he is paralyzed after Doctor Mid-Nite showed Sorrow a previously recorded image of his own face, sending him from Earth to another dimension. Flash meets Black Adam in the past, where he has been sent due to the great speed he traveled, and again uses his speed, this time to return to his own time. After the Flash returns, Black Adam helps the JSA battle the Sin-Eater, a Thanagarian demon. Claiming to be free of Theo's evil influence again, a repentant Black Adam requests membership in the Justice Society, and is granted a probationary membership in JSA #21 (2002). During their tenure on JSA, writers Geoff Johns and David S. Goyer redefined Adam's personality and background, focusing on the character's old-fashioned and militant ideals of justice, and his officious and strongly opinionated attitude. Despite this, he has stated on many occasions that he respects the Justice Society, particularly members such as Jay Garrick. Several other JSA members are shown to be skeptical of Adam's reformation; primary among them is Atom Smasher, who later becomes Adam's close friend after Adam sympathizes with his decision to kill the near-immortal Extant to save his mother. The writers also created added tension in the book by having Captain Marvel, who is wholly unconvinced that Adam has reformed, join the team. One JSA story arc (issues 39 through 44) features Marvel, Hawkgirl, and Mr. Terrific venturing back in time to ancient Egypt, where they meet Mighty Adam before his corruption. During this visit, Mighty Adam is grateful to meet Captain Marvel, as Marvel's presence demonstrates that his legacy will survive him even with his children gone, and, when Marvel transforms back into Billy Batson, Adam expresses admiration for the young man's ability to handle the power of Shazam at such a young age, something he doubts he could have achieved himself. After returning to the present, Marvel notes that he has a better understanding of Adam's motives now after learning about the loss of Adam's family, but Adam rebuffs the offer, commenting that Marvel cannot truly understand him, stating that, while they are not enemies, they will never be friends. Johns and Goyer used this story arc to slightly alter Adam's origin. The hero now hails from the fictional North African nation of Kahndaq, not Egypt, although he serves the Egyptian prince Khufu (who is later reincarnated as JSA member Hawkman). The character of Blaze is completely removed from the origin story, and Adam's rage is described as having resulted from the conquering of Kahndaq (and the murder of his wife and children) at the hands of a magically powered supervillain named Ahk-ton (whose powers resemble future hero Metamorpho), who is working with the notorious immortal Vandal Savage. Mighty Adam kills Ahk-ton during the struggle, and returns to Kahndaq to reclaim it by any means necessary, including murder. The wizard Shazam does not agree with Adam's actions, and robs Adam of his powers and kills him. In JSA #45 (2003), Black Adam and his teammate Atom Smasher both defect from the Justice Society. During the next few issues, Adam forms his own organization, which administers justice the way Adam wants it: "an eye for an eye". His roster includes a mix of DC heroes and villains, including Atom Smasher, Brainwave (who is possessed by Mister Mind), Northwind and the rest of the society of Feithera, Nemesis, and former JSA museum curator Alex Montez, the human host of the demon Eclipso. Adam's collective executes Kobra, a villain who has been acquitted by the legal system (Albeit because his followers had threatened to blow themselves up if he wasn't released) when the JSA could have spared them his escape and the hassle of a trial by simply killing him when he was first captured. Adam then turns his attentions to his old homeland of Kahndaq, now ruled by a militant dictator whose actions had long been ignored by the United Nations. Late 2003 began the publication of a JSA/Hawkman crossover story arc titled "Black Reign," written by Geoff Johns alone, which features Adam and his militia's hostile takeover of Kahndaq. A war soon breaks out, with Adam, his comrades, and the Kahndaqi people on one side, and the Justice Society on the other. The dictator is finally killed by Atom Smasher. By the end of the arc, the JSA leaves Adam in control of Kahndaq, provided that he does not leave its borders, convincing him that he cannot enforce his rule on the world or he is no better than the dictator he'd defeated. Brainwave is saved by the JSA, Mister Mind is apprehended thanks to the Atom infiltrating Brainwave's head - as part of an undercover mission to confirm whether Adam was brainwashing his comrades - and Nemesis and Alex both die during the battle when Alex loses control of Eclipso. Only Northwind and Atom Smasher remain at Adam's side, with Atom Smasher later leaving when a time-travelling clash with Degaton results in him meeting Al Pratt in the 1950s and re-evaluating his past motivations. As Kahndaq's ruler, Adam is depicted as fiercely working to protect his people and his nation, although his arrogance is still a handicap; when the Spectre attacked Khandaq after being corrupted by Eclipso, Black Adam actually told his people that the JSA were also their enemy because he didn't want to give his people the impression that he needed help to protect them, despite the fact that he was clearly outmatched by the Spectre's power. Black Adam is featured heavily in DC's 2005 Infinite Crisis crossover, primarily in the Villains United miniseries as a member of the Secret Society of Super Villains (which he only joins to protect Kahndaq from the Society). Concurrently, in JSA, Atom Smasher leaves Adam's side to return to the JSA. The Society is run by Alexander Luthor, Jr., a character from the alternate world Earth-Three, who disguises himself as the Lex Luthor of the post-Crisis Earth. The Infinite Crisis limited series centers around Alexander Luthor's plan to restore the Multiverse. Needing a member of the Marvel Family to power the apparatus he has designed to recreate the alternate Earths of the Multiverse, Luthor has the Society betray and capture Black Adam. With the help of the mind-controlling powers of the Psycho-Pirate, Luthor is able to control Adam and have him call down the magic Shazam lightning bolt to fuel the apparatus; the Spectre's rampage during the Day of Vengeance storyline has reverted all magic in the DC Universe to a raw, chaotic structure, and the death of the wizard Shazam has transformed him into a tether that can be used to harness the magic, allowing Alexander to use any member of the Marvel family to power his equipment if the wizard's name is spoken. By the end of the miniseries, Black Adam is freed by Superboy and Nightwing. Adam quickly kills Psycho-Pirate and, following a failed attempt to defeat Superboy-Prime (which reveals that magic does not affect Superboy-Prime, as Adam's blows allegedly only "tickled"), he is transported to Earth-5 when he is punched too far from the Tower by Superboy-Prime. He joins the heroes, (although he is generally regarded as being on his own side by the other combatants), in the Battle of Metropolis, destroying Amazo shortly after his arrival. Black Adam appears as a featured character in DC's weekly 52 comic book. Depicted as the violent protector of the nation of Kahndaq, Adam kills several supervillains in public and on television to demonstrate his views. As a result, he is distrusted by the superhuman community. In 52, DC introduces Adrianna Tomaz, the "most beautiful slave from Egypt" offered to Adam by Intergang as a token to curry his favor, along with $2,000,000 in African gold. Black Adam sends Intergang a message by killing Noose, by tearing his face apart, and sending the rest of the Intergang members home, leaving Adrianna behind. During Week 10, he creates an international metahuman coalition against the perceived metahuman supremacy of the United States. He gets members of the Great Ten of China, and Russia's Rocket Reds among others, to join the coalition. Adrianna begins to counsel him and stays as a refugee. She makes him a ruler who shows more mercy and performs charitable acts. In Week 12 of the series, Adam gains a magical amulet, hidden on the scarab in which Shazam imprisoned him. With help from Captain Marvel, who first thinks Adam is trying to attack him, he transforms Adrianna into the superheroine Isis. Four weeks later, in Week 16, he proposes with a jewel given to Cleopatra by Caesar, and the two are married, with Captain Marvel and the rest of the Marvel Family as witnesses, Mary as bridesmaid. Renee Montoya and the Question prevent a suicide bomber, a child sent by Intergang, from ruining the wedding. For this they are awarded the country's highest honor, the Order of the Scarab, by Black Adam, although he is furious to find Renee is missing the ceremony while sleeping with a Khandaqi woman from sorrow over killing a child. In 52 Week 23, Black Adam and Isis, with the assistance of the Question and Renee Montoya, find Isis' brother Amon. Due to a failed escape attempt, Amon suffers near-fatal wounds from repeated beatings, meaning that he will never walk again. In order to save his life, Black Adam bestows a portion of his own power on the boy, as Captain Marvel did for Captain Marvel Jr. Isis' brother then becomes a new addition to the Black Marvel Family under the name Osiris. They help the Marvels beat the demonic Sabbac using their lightning strike on Halloween when he tries to sacrifice children to the demon Neron while several stories high. He is then moved to an unknown location. The Black Marvel Family also has a charity dinner with Venus Sivana, during which Osiris first meets a talking crocodile (whom Osiris names Sobek). Osiris is accepted into the Teen Titans. Upon returning from a mission, he and the rest of the Black Marvel Family are attacked by the Suicide Squad. The Black Marvels defeat the Squad, but not before footage of them in battle (including Osiris' accidental killing of a Squad member who was attacking Isis) is captured by Amanda Waller, who uses it to further ruin the Black Marvel Family's reputation. Meanwhile, Khandaq is struck by a number of natural disasters, which seem to have a supernatural origin. He engages in more beneficial activities, like a charity dinner with the Sivanas. Wracked with guilt over the death of the Persuader, Osiris ventures to the Rock of Eternity and pleads with Captain Marvel to have his powers removed, as he fears Black Adam's influence (and those of his gods) has tainted him with evil. Black Adam arrives and the two battle until subdued by Isis and the Marvels. Osiris relents, seemingly accepting that he has repented enough for Persuader's death, and accompanies the Black Marvel Family back home. However, when Osiris and his friend Sobek, the talking crocodile, are alone, he admits that he was only putting up a front to appease those around him, and that he could never forgive himself for killing anyone, as Black Adam has. Sobek advises Osiris that he should say Black Adam's name and rid himself of the powers he has come to hate. Osiris does so, only to be betrayed and brutally devoured by Sobek, while in his mortal form. Isis and Adam confront Sobek after finding Osiris' body, who reveals that he is Famine, the Fourth Horseman of Apokolips, one of four creatures created by Intergang to attack Black Adam. Adam swiftly disposes of Sobek by hyper-elongating his jaws, and does battle with the other three Horsemen. One of them, Pestilence, infects Isis with a deadly disease before Adam kills him and his partner War. A gravely ill Isis saves Adam from Death using her powers to send Death into the sky with a geyser of lava, and tells Adam with her dying breaths that she was wrong to try to change his views on justice, and that he should avenge both her and Osiris. After the funeral in honor of his family, Adam attacks the neighboring Intergang-associated nation of Bialya in search of Death. Sick with grief over the death of his family, Adam proceeds to exterminate the entire 2,000,000 citizen population of Bialya in his hunt for his target. Upon confronting his family's killer, the enraged Adam battles a greatly enhanced Death, who has been feeding on the slaughter of Bialya's population. Despite his enhanced strength, Death is defeated by Adam with a barrage of mystic lightning. While torturing Death for an entire day, Adam learns the identity and whereabouts of the Horsemen's masters, flying off to Oolong Island in search of the Science Squad. He easily gets past their defenses, even a weapon equivalent to the meteorite that killed the dinosaurs proving incapable of stopping him. However, Adam is subdued by the scientists, who projected a dimensional field into his mind the size of a football field, rendering him powerless. They then use an electro-crown to reroute his body's impulses and hold him as a prisoner. Dr. Sivana tortures Adam for weeks using the electrical crown, which only serves to enrage Adam further, who vows to tear them all apart. The "Science Squad" makes a worldwide announcement that they plan to sell Black Adam as a living weapon to the highest bidder, resulting in the Justice Society assaulting the island to free Adam. It is revealed that Chang Tzu had built the Horsemen under orders of China, who wanted Adam and his family to be assassinated after Adam withdrew from the Freedom of Power Treaty. Adam refuses to be taken into custody for the destruction of Bialya, despite the requests of Atom-Smasher, once more flying off to seek revenge for the death of his family. Enraged to the point of madness, Black Adam launched a week-long attack against the heroes of the world, referred to afterward as "World War III". Tearing across the globe, Adam destroys many historical landmarks, including the Leaning Tower of Pisa and the Egyptian pyramids in his battle with dozens of superheroes who attempt to stop him. After fighting and defeating the Marvel Family, the Global Guardians, the Doom Patrol, and the Teen Titans resulting in the deaths of Young Frankenstein and Terra, Adam's path of destruction eventually moves through China. Adam's sustained assault finally prompts the decimated Chinese superhero team the Great Ten to allow the Justice Society and a coalition of other American metahumans onto Chinese soil in an attempt to stop Adam. Captain Marvel pleads with the Egyptian Gods to stop Black Adam's rampage, but the Gods laughingly inform Marvel that Black Adam has their blessing. Although he failed to remove Black Adam's powers, Captain Marvel gathers with a group of mystics, including Zatanna and the Phantom Stranger, to work a spell which would allow him to use his powers to transform Black Adam back to his human form instead of himself. Green Lantern (Alan Scott) and Power Girl restrained Black Adam as they dragged him into the lightning's path, but the resulting blast tears him from their hands. Teth-Adam, once again human, escaped with the aid of Atom Smasher, who carried him to safety after saving him from his fall. After Adam was depowered, Marvel also changed Adam's magic word with his abilities as the new guardian of the Rock of Eternity, keeping it secret to prevent him from ever regaining his powers. Left mortal, Adam wandered the Middle East, attempting to guess the word that would restore his power. Black Adam's quest to gain his powers back between the events of 52 and Countdown was depicted in a six-issue miniseries entitled Black Adam: The Dark Age, published from late 2007 to early 2008. Sometime after his defeat in World War III, Adam gathers a small band of Kahndaqi men who still remain loyal to Adam, and sneaks into a heavily guarded and war-torn Kahndaq in disguise (having had his minions beat him mercilessly to alter his appearance) to retrieve the bones of Isis. The men kill the guards at the tomb, and get Isis' remains. Most of Adam's men perish in a battle with a band of soldiers waiting for Adam at the tomb, but Adam manages to escape with Isis' remains. When the Justice Society later arrives at the scene following the shootout, Atom Smasher finds Isis' left ring finger and wedding ring, which Adam accidentally dropped during his escape. One of Adam's loyal servants, Hassan, the last surviving, offers himself as food to Adam to help him survive across the mountains. Adam takes Isis' bones to a Lazarus Pit in the Himalayas with the intentions of using it to resurrect her, but cannot complete the process without either using all of Isis' bones (including the missing ring finger) or her magical amulet, which has gone missing. He makes his way to Doctor Fate's tower looking for the amulet, and finds supervillain sorcerer Felix Faust, who was trapped in the tower by Ralph Dibny during 52. Faust reveals to Adam that Mary Marvel and Captain Marvel Jr. broke Isis' amulet into several pieces and scattered them across the globe. Realizing that Isis is powerful enough to free him from the tower, Faust agrees to help Adam locate the pieces of the amulet. He enacts a spell which allows Teth-Adam to transform into Black Adam by drawing from the residual magic remaining in Isis' bones, with Adam using her name as a magic word. However, Faust warns Adam to use his powers only when absolutely necessary, lest Adam drain all of Isis' remaining power and make her resurrection impossible. Using a homing signal etched into his hand by Faust, Adam sets out across the globe hunting down the pieces of Isis' amulet. At the same time, the Justice Society is working with the Marvels to perfect a way of using the Shazam lightning bolt to track Black Adam and bring him to justice. In addition, a hired team of armed vigilantes covertly funded by the U.S. and several other nations is hunting Adam as well, and have developed an "Eternity bullet" - manufactured from shards of the Rock of Eternity - which can penetrate Adam's skin and kill him. Despite these challenges, Adam is able to retrieve all of the pieces of Isis' amulet (and Atom Smasher meets with Adam in secret to give him Isis' ring finger, though he keeps the ring to himself). Adam spends the entire quest reciting the names of streets, signs, locations, moods, and emotions in hopes of stumbling upon his new magic word. At the very end of his quest, Teth-Adam walks into a Fawcett City malt shop and orders a chocolate egg cream - only to find that "chocolate egg cream" is what Captain Marvel changed his magic word to. With his original powers restored, Adam flies to Fate's Tower and confronts Faust. He tells Faust that if he crosses him he will come after them. Faust attempts to resurrect Isis and apparently succeeds, but the resurrection fails, and Isis' bones crumble to the floor after swearing eternal hate on her husband. Faust blames Black Adam for using Isis' power too much, and distraught, Black Adam flies away, ending up in Gotham City. It is, however, revealed that the bones that Faust showed to Black Adam belonged to Ralph Dibny, and Faust resurrects Isis. With her under his power, Faust creates a door, and exits the tower. In Countdown #47 (June 2007), a depowered Mary Marvel who is being chased by criminals stumbles upon Black Adam, hiding out at the former Kahndaqi embassy in Gotham City, who kills the criminals, and she finds that he has killed several others that have had the misfortune to find their way into the building. It appears that Adam is about to harm Mary as well as he starts strangling her, but instead, he transfers all of his powers to her (including those he recovered from Isis). He departs in his mortal form after she frees him from a wall that has toppled on him. Black Adam is featured in Final Crisis #5, assisting a small group of Earth's heroes, many of whom he fought before, in battling against Darkseid's forces. Black Adam battles Mary Marvel and perceives a "leering old man" inside of her. He attempts to kill her but is stopped by Tawky Tawny and Shazam (Freddy Freeman). Adam is subdued by enemy forces. A brooding, disparaged Black Adam appears in Justice Society of America #16 (2008), hiding in the tomb of Isis and Osiris and killing potential looters, along with sleeping in the coffins. He reveals through narration that the whole meaning of his power transfer to Mary Marvel was the hope that her innocence would eventually force Mary into surrendering back his power to him, but changed enough to allow Isis' rebirth. After the attempt failed, Adam returned to his state of mourning and anger. Adam's mourning is cut short, however, when he discovers a bloodied flower in his shrine, believing it a sign from Isis. Despite her powers and consciousness being heavily sedated by Felix Faust's spells, Isis manages to use her powers to create a trail of flowers (including a batch in the shape of the Shazam lightning bolt symbol) to lead Adam to where Faust has been holding her captive. Finding Isis and freeing her from Faust's control, Black Adam then journeys to the Rock of Eternity and battles Billy Batson (now Marvel, the wizard of the Rock of Eternity, rather than Captain Marvel), using the same scarab necklace that once imprisoned him to strip Billy of his powers with help from Isis sending lightning at Marvel and use them to take control of the Rock of Eternity. Isis plans to use the power of the Rock to "cleanse the earth" of all of humankind, which she sees as irrevocably evil. Black Adam and Isis are even able to convince Mary Marvel to join their crusade. The Black Marvels are soon challenged by the Justice Society, who has come to the aid of the powerless Billy Batson when he was trying to summon Freddy. During the course of the fight, the combatants end up in Kahndaq, where the people praise Black Adam's return. Isis then kills several of the followers, claiming that they are tainted by this new Earth. Black Adam attempts to protect his people, only to be attacked by Mary and Billy, who had been tainted by Mary's power. At that point, Jay Garrick (who had earlier been thrown by Isis into the mists surrounding the Rock of Eternity) appears with the spirit of Billy's father, and Shazam, whom the two had recovered from the Rock of Finality, where he had been imprisoned in a statue. Adam is convinced to return his power to Shazam, so that he could save Isis from her corruption. In turn, Shazam - who is furious at the misuse of the power he behested on his champions - takes the power from Isis, Billy, and Mary, and transforms Teth-Adam and Adrianna into statues. Sometime later a shadowy figure appears in a bolt of lightning, gloating that Shazam has given him new champions to play with. After the Blackest Night storyline, the resurrected Osiris returns to Khandaq, vowing to restore the kingdom to its former prosperity. Osiris takes the petrified bodies of Adam and Isis and flies off to an unknown destination. After failing to revive Adam and Adriana, Osiris enlists in Deathstroke's new team of Titans in hopes of finding a way to save them. He has been told to resurrect Isis, but not Adam, which he does by killing people with his lightning by saying Isis. In The New 52 (a 2011 reboot of the DC Comics universe), Black Adam was mentioned by Dr. Sivana while listening to witness reports of the wizard Shazam. Sivana mentions that Black Adam was a slave who was teleported from his prison cell to the Rock of Eternity and granted his powers by the wizard. Adam then went on to save Kahndaq from the Seven Deadly Sins before vanishing. During Dr. Sivana's explanation, drawings of Black Adam are shown in a historical text, displaying a slightly different look from his previous incarnations. Dr. Sivana later uses his new-found magic eye inside of some ruins to read a magically hidden hieroglyph that makes the wall explode, releasing Black Adam from his tomb. Adam is then shown in a revamped version of his original costume, which includes a cape, hood, and a metallic belt instead of a sash. His lightning bolt appears as an opening into his body with magical energy visibly inside of him. In Black Adam's subsequent pursuit of Shazam, Billy is shown the beginning of Black Adam's origin. It centers around the story of Aman, a Kahndaqi boy who was thrust into abuse and slavery long ago. Thinking that he can surely relate and connect with another boy who has suffered like he has, Billy (without hearing the rest of the tale) rushes to Black Adam and tries to reason with him. To his surprise, Black Adam simply grabs him and tells him he "knows nothing". Black Adam shows Billy the rest of his origin, which reveals that Aman had an uncle (who helped Aman escape slavery), whose name was Adam. Adam was injured during their escape, and when Aman was chosen by the wizard to be his champion, Aman shared his power with Adam to heal him. Afterwards, although Aman wanted to use his new power to help his people and cure his former slavemasters of their evil souls, Adam only sought vengeance against those who had enslaved them. To this end, when Aman called down the lightning, Adam seemingly killed Aman so that he himself was the sole recipient of the power. However, the details of Aman's "death" are not shown, leaving his fate open to speculation. Black Adam refers to Aman's "sacrifice", and tells Billy that he will go to any lengths to "free this world from those who enslave it". In the finale of Shazam's origin story, Black Adam holds Billy's foster siblings hostage and demands he give up his power or they will die. But instead of giving Black Adam his power, he shares it with his foster siblings, empowering them as "Shazams", as well. Together, they fight Black Adam and the "host" that the seven sins have inhabited. Eventually, the collateral damage endangers civilians, so Billy orders them to save the people while he alone battles Black Adam. He finally realizes that his knowledge of his newly acquired powers cannot defeat Adam, who has much more experience using his magic, and decides to change back into his child form. As normal teenager Billy, he challenges Black Adam to also change (into Teth-Adam) to make it a "fair" fight. After some convincing, he does so, but because he has been alive for centuries due only to his "Black Adam form", as a normal human he quickly ages and turns to dust. During the Forever Evil storyline, revolutionaries in Kahndaq use an ancient scroll to attempt to revive Black Adam so he will be their champion once again to save them from their oppressive ruler. A man named Amon begins to read the ancient spell, but before he can complete it, the military attacks them. Amon, injured, makes his sister Adrianna complete the spell which revives Black Adam. He proceeds to defeat the military forces and kills the Kahndaqi ruler. Acting as Kahndaq's protector again, Black Adam sees the Crime Syndicate's message "The World is Ours" and gets angered saying "this world belongs to no one!" When Jimmy Olsen activates his Superman signal when confronted by Ultraman, Black Adam answers the call and ends up fighting Ultraman. Ultraman manages to defeat Black Adam by breaking his jaw and throws him unconscious into the ocean. Black Manta managed to fish Black Adam out of the ocean when he meets up with Lex Luthor. Lex Luthor works on resuscitating Black Adam. When it comes to the final battle against the Crime Syndicate, Black Adam and Sinestro move the moon where the sun ends up weakening Ultraman. In the aftermath of the battle against the Crime Syndicate, it was stated that the villains who helped to stop the Crime Syndicate would have their criminal records wiped. Black Adam and Sinestro didn't care about that and left in their separate ways, along with the other villains. In "DC Rebirth," Black Adam appears in the "Dark Nights: Metal" miniseries. He is revealed to be a member of the Council of the Immortals, a group with the oldest beings of Earth, such as Vandal Savage and Hawkgirl. Black Adam supposedly kills Doctor Fate at the Rock of Eternity while in a fight against him, Wonder Woman, and Hawkgirl, who is by that point transformed by Barbatos into an evil version of herself named Lady Blackhawk. When Billy and his family stumble upon the doors to the various Magiclands and go to the Funland, Black Adam arrives at the Rock of Eternity some time after their departure, noting that the Council of Eternity sealed off the Magiclands for a reason, that the door to the Monsterland is still sealed for now, and that Billy has no idea what he's done. In the "Watchmen" sequel "Doomsday Clock," Black Adam takes advantage of "the Superman Theory" and the metahuman arms race where he "saves" Creeper from Kobra's cult and allows any metahuman refugees to seek asylum in Khandaq. He and Creeper later attack Israel. S for the stamina of Shu Using Shu's virtually unlimited stamina, Black Adam can withstand and survive most types of extreme physical assaults. Additionally, he does not need to eat, sleep, or breathe and can survive unaided in space. His godly metabolism provides him with far greater than human potency in all physical activities. Sustained by the magical energies coursing through his body, Adam is immortal. H for the swiftness of Heru By channeling Heru's supernatural speed, Black Adam can move at sub-light speeds in orbit. In outer space, Black Adam can fly at trans-light speeds, while on Earth he has been depicted running at a maximum Mach 500. He was able to give his speed to the Golden Age Flash, running at incredible speeds with him. A for the strength of Amon Black Adam has a phenomenal level of super strength, able to easily bend steel, punch through walls, produce powerful shockwaves by clapping his hands, and lift massive objects. Adam's strength is generally depicted of being on levels equal to those of Superman and Captain Marvel, though some writers have portrayed his strength as possibly outmatching them. On at least one occasion, he has been able to hold his own against an assemblage of the Justice League, the Justice Society, the Great Ten, the Martian Manhunter (who has strength depicted as close to that of Superman) and the Teen Titans. Z for the wisdom of Zehuti Black Adam has instant access to a vast level of scholarly knowledge, which allows him to know multiple languages. The wisdom of Zehuti also provides him with counsel and advice in times of need. A for the power of Aton Aton's power allows Black Adam to fly, fuels the magic lightning bolt that transforms Adam, further enhances Adam's superhuman physical abilities, and provides magical resistance against a massive amount of magic spells and attacks. Adam can use the lightning bolt as a weapon by dodging it and allowing it to strike an opponent or target. It allows him to travel to the Rock of Eternity, thus allowing interdimensional and time travel. M for the courage of Mehen This aspect is primarily psychological and spiritual. Mehen's courage endows Black Adam superhuman amounts of inner strength, willpower, discipline and resolve from which to draw upon in times of hopelessness, and possibly great fighting skills. He is constantly supported by a harmonious presence of good will and unflinching courage that he never backs down from a challenge or feels any debilitating amount of fear or despair, even in the face of the most intimidating of opponents. His strength of mind renders him resistant to telepathy and mind control. In some depictions, the courage of Mehen also provides a degree of his physical invulnerability to harm. Additionally, Adam's senses are acutely sharpened, as he claimed to be able to smell Felix Faust's sweat. Black Adam has repeatedly been described as a warrior who had proven himself to be highly skilled even before he was given the power of Shazam. He has recently acquired the Power of the goddess Isis, making him stronger than ever. When Black Adam utters the magic word, he not only gains his usual powers, but all of his original powers are greater in strength because of the extra power he gains from Isis. The Power of Isis should also grant him control of nature and telekinesis, although he has not shown these abilities. Saying the magic word again initially changes Black Adam back into Theo Adam, although when the Spectre strips him of his powers during the Black Vengeance affair, he reverts to Teth-Adam, the ancient Khandaqi warrior who was Mighty Adam. Subsequent depictions in the 52 maxiseries also showed Teth-Adam as Black Adam's default mortal identity. However, Black Adam very rarely voluntarily changes back to his non-powered form. S for the Wisdom of Solomon As Black Adam, Teth has instant access to a vast amount of scholarly knowledge, including most known languages and sciences. He has exceptional photographic recall and mental acuity, allowing him to read and decipher hieroglyphs, recall everything he has ever learned, and solve long mathematical equations. He also has a great understanding of divine phenomena in the mortal world. H for the Strength of Hercules Hercules' power grants Teth/Black Adam immense superhuman strength, making him one of DC Comics' strongest characters. He is able to easily bend steel, punch through walls, and lift massive objects. In the New 52 comics, his strength is comparable to that of a demigod. A for the Stamina of Atlas Using Atlas' stamina, Black Adam can withstand and survive most types of extreme physical assaults, and heal from them. In some stories, the stamina of Atlas makes Teth/Black Adam nearly invulnerable. The stamina of Atlas also prevents him from getting tired. Z for the Power of Zeus Zeus' power, besides fueling the magic thunderbolt that transforms Black Adam, also enhances Adam's other physical and mental abilities, and grants him resistance against all magic spells and attacks. The hero can use the lightning bolt as a weapon by dodging it and allowing it to strike an opponent or other target. The magic lightning has several uses, such as creating apparatus, restoring damage done to the hero, and providing fuel for magic spells. The current-continuity version of Teth is able to personally generate and control lightning for various uses. He also can use it readily from his fingertips. The power of Zeus also enhances the levels of Adam's other powers as well. A for the Courage of Achilles This aspect gives Teth-Adam/Black Adam the courage and bravery of Achilles. It also aids the hero's mental fortitude against most mental attacks. M for the Speed of Mercury By channeling Mercury's speed, Adam can move at superhuman speeds and fly, enabling him to fly faster than the speed of light. After his resuscitation, Adam's abilities harnessed from the gods later reverted to his Egyptian pantheon. Black Adam is the primary villain of the first story arc of the Johnny DC comic book series Billy Batson and the Magic of Shazam! by Mike Kunkel, an all-ages series which follows its own continuity derived from Jeff Smith's 2007 miniseries Shazam! The Monster Society of Evil. Black Adam appeared in the first four issues of Billy Batson, published between late 2008 and early 2009. In this version, Black Adam's alter ego, Theo Adam, is a fourteen-year-old boy, although much of the rest of his backstory remains true to the original Fawcett version of the character. Within the context of the story, the wizard Shazam imprisoned the errant Theo Adam in an alternate dimension during the days of ancient Egypt, only for Adam to become free after a battle between Captain Marvel and Mister Mind opens a hole which allows Adam to escape. However, Theo Adam has forgotten the magic word ("Shazam") which will transform him into Black Adam, but after learning that young Billy Batson has taken over the role of Shazam's champion as Captain Marvel, Theo calls upon the help of the Seven Deadly Enemies of Man and captures Billy, attempting to force Billy into telling him the word. When Billy's sister Mary finds her brother captured, she transforms into Mary Marvel to save him, only to have Adam overhear her, repeat the word, and become Black Adam again. In the alternate timeline of the Flashpoint event, Black Adam challenged the Outsider, who used technology to summon the magic lightning to change him back to Teth-Adam. He is then knocked off the train they were fighting on, suffering severe injuries afterward. Black Adam is later killed by J'onn J'onzz. Black Adam is among the mind-controlled villains who attack the heroes as they assault Krona's Stronghold in #4. He is shown being defeated by Marvel's Captain Mar-Vell. In the alternate future of Futures End, Black Adam was imprisoned within the Phantom Zone by Superman (who is actually Billy Batson/Shazam). When Ray Palmer, Amethyst, and Frankenstein travel through the Phantom Zone, their ship is forced to its normal size and reveals itself to the dimension's occupants including Black Adam. He attacks the ship and rips off Frankenstein's arm but the trio manage to escape from the Phantom Zone. When Ray becomes the new leader of Stormwatch, he frees Black Adam from the Phantom Zone, promising to take him back to Earth, to help save Hawkman, Amethyst, and Frankenstein from Brainiac. Black Adam repeatedly calls down lightning bolts to shock Brainiac, giving the others time to escape and he joins them later on, fighting off Brainiac's robots. Black Adam makes it safely to Earth with the rest of the new Stormwatch and fights against Father Time's forces when he arrives to take the Engineer. He soon returns to Earth afterwards. Black Adam in 1981's Shazam! animated series. Adam appeared in the Shazam! portion of The Kid Super Power Hour with Shazam! episode "Black Adam's Return" voiced by Lou Scheimer. His origin is similar to the Pre-Crisis Black Adam. As in his original comic book appearance, he is tricked into saying "Shazam! ", this time with a scroll, and turns to dust, presumably killing him. However, he returns in a later episode, "A Little Something Extra": this time, after being thwarted in his scheme to destroy North America by causing a build-up of pressure in the earth's crust, he is again tricked into saying "Shazam" and is sent back to the days of ancient Egypt. In this version, he was shown knowing magical spells, such as bringing a baboon in an exhibit called Thoth to life and hypnotizing Mary Marvel, in addition to his Marvel powers perhaps to level the field against the numerically superior Marvel Family. Additional powers include: freezing vision, mystical paralysis, animate statues, and teleportation. He also had mystical artifacts like a grenade which shape-changed Captain Marvel Jr. into a dog (though Shazam managed to undo this). He has an associate, Princess Jemai, an ancient Egyptian princess with magical powers who resembles Isis. The character is briefly mentioned by his alter-ego's name, Teth-Adam, during a flashback in the "Ancient History" episode of Justice League Unlimited. Thousands of years in the past, Egyptian troops under the command of Bashari (who would be reincarnated in the present as John Stewart, a member of the Green Lantern Corps and the Justice League) liberated Kahndaq from enemy rule. In gratitude, Teth-Adam gave 100 stallions to Egypt's rulers, Katar and Shayera (who would be reincarnated as Hawkman and Hawkgirl). 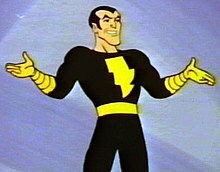 Black Adam appears in the Batman: The Brave and the Bold episode "The Power of Shazam" voiced by John DiMaggio. Like in the comics, he is revealed to be Shazam's former champion who abused his power and was banished to another planet. Batman teams up with Captain Marvel to battle him and Dr. Sivana, who wishes to usurp the magic of Shazam that gives Billy Batson his power. Adam is betrayed by Sivana, who absorbs his power, and turns Adam into an old man. After Sivana is defeated (by Batman mispronouncing "Shazam" to trick Sivana into correcting him and reverting, as per Black Adam's original comics defeat), Black Adam disappears with Shazam fearing his return. Black Adam's name is mentioned in the Smallville episode "Isis". A museum has a name plate that reads "Dagger of Teth-Adam". Black Adam appears in the Young Justice episode "Revelation". He is seen as a member of the Injustice League who frequently attacks Superboy. Black Adam appears in the Justice League Action episode "Shazam Slam", voiced by Gary Cole. He first appears where he invades the Rock of Eternity. After the Wizard summons Billy Batson, Black Adam uses a special orb to intercept the lightning bolt that transforms Billy into Shazam. Upon imprisoning Billy, Black Adam tosses the Wizard out of the Rock of Eternity. Black Adam then unleashes the Brothers Djinn onto the Earth. With help from Batman, the Wizard was able to free Billy Batson where he became Shazam and defeated. Shazam then banishes Black Adam to the farthest reaches of the galaxy. Later on, Black Adam returns where he helps the remaining Brothers Djinn Abnegazar, Rath, and Nyorlath fight Superman, Wonder Woman, John Constantine, Green Arrow, Plastic Man, and Swamp Thing. The tide is turned when Batman arrives as Billy Batson transforms into Shazam where the Justice League defeats Black Adam, Abnegazar, Rath, and Nyorlath. The four of them were then thrown into a portal where John Constantine sent them someplace to where Batman couldn't get the answer to from John Constantine. New Line Cinema began developing a Shazam! live-action feature film in the early 2000s, with Peter Segal (The Longest Yard, 50 First Dates) attached as director and Michael Uslan as producer. Actor and former wrestler Dwayne "The Rock" Johnson agreed to appear in the film as Black Adam. The film was shelved and left unproduced in 2009, but Warner Bros. and New Line Cinema resurrected the project after the success of DC's own Man of Steel. Johnson is still cast as Black Adam, whose depiction will be as the modern anti-hero version of the character. In February 2017, Lights Out director David F. Sandberg was in talks to direct. Shazam!, which will be released by New Line Cinema through parent company Warner Bros., will be written by Jack the Giant Slayer writer Darren Lemke and released on April 5, 2019. In July 2017, it was confirmed by Geoff Johns that Black Adam will no longer appear in the film. While Black Adam doesn't physically appear in Shazam! he is mentioned by The Wizard as a previous champion of his who turned evil by releasing the Seven Deadly Sins, and shown briefly- hooded- in a magical projection. Dwayne Johnson will be portraying the character in both a spinoff movie and in a planned Shazam! sequel. Black Adam appears in an animated short film entitled Superman/Shazam! : The Return of Black Adam (released on the DC Showcase Original Shorts Collection DVD compilation as part of the DC Universe Animated Original Movies), voiced by Arnold Vosloo. He returns to Earth following his 5,000 years of exile to wreak havoc on Earth only to end up fighting Superman and Captain Marvel. After a long battle, he is defeated by Captain Marvel but spared his life. When Tawky Tawny arrives, Black Adam identifies him as Shazam's lackey. To evade being banished farther from Earth, Black Adam quotes "Shazam" and turns into a withered old man who turns to dust. Black Adam appears as a villain in a cinematic trailer for the video game DC Universe Online MMORPG, voiced by Alexander Brandon. In the cinematic, "Who Do You Trust", the trailer depicts a dark future where Lex Luthor and other villains are engaged in what seems to be a final battle against what's then left of the Justice League. Black Adam is primarily engaged in battle with Green Lantern- seemingly killing him and the Flash (also Harley Quinn) when he calls down his lightning bolt and triggers an explosion-, however he is ultimately killed by Superman when the latter unleashes his heat vision upon Black Adam's head. In this depiction he has the pale flesh and elfin elongated ears along with his standard costume. Adam appears during both the heroes' and villains' questlines, attempting to resurrect Isis. He is tricked by Felix Faust, draining Adam of his powers, leaving him helpless, while an undead Isis attempts to battle the player and Faust flees with his newfound power. The player battles Isis, defeating her, ultimately restoring Adam's powers. Adam however is less than grateful, and swears vengeance upon Faust for fooling him and the player for robbing him of the chance of being with Isis once more. Adam appears later as the final boss in the Kahndaq raid. Black Adam appears as a playable character in DC Unchained. Black Adam appears in LEGO Batman 2: DC Super Heroes as an unlockable playable character and mini boss, voiced by Fred Tatasciore. Black Adam appears as a playable character in Lego Batman 3: Beyond Gotham, with Fred Tatasciore reprising his role. Black Adam appears as one of the main characters in Lego DC Super-Villains, voiced again by Fred Tatasciore. Black Adam appears as a playable character in Injustice: Gods Among Us, voiced by Joey Naber. He is featured in the game's opening, battling the Justice League alongside other featured supervillains until he is defeated by Shazam. In an alternate reality, Black Adam is affiliated with Superman's Regime, agreeing with his policies, and is shown to have a shaved head. He engages Green Arrow in the Batcave. When it comes to the Regime attacking Metropolis and Gotham City to set an example to the world, the alternate Black Adam takes part in the attack on Gotham City until he is defeated and frozen by the Prime Superman. In Black Adam's ending, he realizes that humanity is unworthy of sharing Khandaq's form of government. Returning home, he and Isis create a magic barrier around Khandaq, turning it into a paradise, with Black Adam having destroyed all other life on Earth. Black Adam returns as a playable character in Injustice 2 with Joey Naber reprising the role. In the game's story, he finds Supergirl's spaceship wandering in space and takes her to Earth, where they free Wonder Woman and plan to break Superman out of prison to bring the Regime back to life. When the threat of Brainiac forces the two sides to team up, he and Aquaman use the Rock of Eternity and the Atlantian Trident to weaken the ship. In his single player ending, Brainiac's invasion destroyed Kahndaq and killed Isis. When he brought his wife's body to the Lazarus Pit, Ra's Al Ghul blocked the way and only allowed him access if he assists Ra's in rising to power. DC Direct has released two action figures of Black Adam, the most recent based on the work of artist Alex Ross. Black Adam appeared as the main villain in a set of View-Master reels starring Captain Marvel. In 2009 Black Adam was released in the 9th wave of DC Universe Classics series. In 2011 Black Adam and Shazam! (Captain Marvel) were rereleased in a two pack named Mightiest Mortals. In 2016 Black Adam was released in the 2nd wave of DC Collectible's DC Icons series. He also appears as a character in the Graphic Audio audiobooks for Infinite Crisis (in a small role) and 52 (in which he plays a major part). Shazam! and the Shazam Family! Annual #1 (2002). Reprints Black Adam's origin from Marvel Family #1 (1945), among other Marvel Family stories. Stories by Otto Binder; art by C. C. Beck, Pete Costanza, Mac Rayboy, Marc Swayze, Bud Thompson, and Jack Binder. ^ "Comics History 101: Everything You Need to Know About Black Adam - IGN.com". Retrieved 9 March 2019 – via www.ign.com. ^ "Page not found". moviepilot.com. Retrieved 9 March 2019. ^ Hayes, Britt. "Dwayne Johnson Teases "Anti-Hero" Role in 'Shazam'". ScreenCrush. Retrieved 9 March 2019. ^ Black Adam is number 16 , IGN. ^ a b Kroll, Justin (September 3, 2014). "Dwayne Johnson to Play Black Adam in New Line's 'Shazam,' Darren Lemke To Script (EXCLUSIVE)". Variety. Retrieved September 3, 2014. ^ a b c Greenberger, Robert (2008). "Black Adam". In Dougall, Alastair. The DC Comics Encyclopedia. London: Dorling Kindersley. p. 49. ISBN 0-7566-4119-5. ^ Dwayne McDuffie & Geoff Johns (writers); Joaquim Dos Santos (director) (2006-04-29). "Ancient History". Justice League Unlimited. Season 3. Episode 11. Cartoon Network. ^ Lee, Patrick (November 5, 2007). "Johnson is Shazam! 's Adam". Sci-Fi Wire. Archived from the original on December 11, 2008. ^ Johnson, Dwayne (September 3, 2014). "Dwayne Jonhson: ""Kneel at his feet or get crushed by his boot." My honor to become.. #BlackAdam #TheAntiHero #DCComics"". Twitter. Retrieved September 3, 2014. ^ Hughes, Mark (September 3, 2014). "'The Rock' Dwayne Johnson Confirmed For Shazam Movie". Forbes. Retrieved September 4, 2014. ^ "DC's 'Shazam' Movie Eyeing 'Annabelle 2' Director". The Hollywood Reporter. Retrieved 9 March 2019. ^ "DC Universe Online Official Site". ^ "DC Universe Online Cinematic Trailer: Who Do You Trust?". ^ Nieves, Davey (22 July 2018). "Syndicated Comics". Retrieved 9 March 2019. ^ "Injustice: Gods Amond Us Official Site". Archived from the original on 2016-04-13.